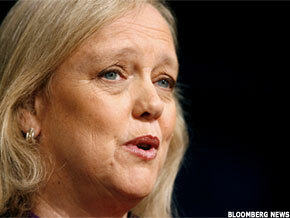 HP looks set to appoint Meg Whitman as its new CEO, reports AllThingsD, with an announcment potentially coming after Thursday's market close. PALO ALTO, Calif. ( TheStreet) -- HP ( HPQ - Get Report) looks set to appoint former eBay ( EBAY - Get Report) chief Meg Whitman as its CEO, according to AllThingsD, which says that an announcement could come after market close. Citing multiple sources close to the situation, AllThingsD reports that Whitman, recently ousted from eBay, is poised to become HP's next CEO. HP declined to comment when contacted by TheStreet, although AllThingsD reports that Whitman's appointment is "nearly a done deal." Rumors that HP's board plans to oust incumbent CEO Leo Apotheker have swirled for the last couple of days, following a turbulent few months at the under-pressure tech giant. Barely a year into the job, Apotheker's attempts to revamp HP, including a possible selloff of its vast PC business, have proved unpopular with investors, and big questions are being asked about his strategic vision. One of the best-known faces in Silicon Valley, there had been speculation that Whitman would take an interim CEO's role at HP, although sources told AllThingsD that she will be taking over on a long-term basis. Chatter about Whitman's possible appointment, however, sent the company's shares down on Thursday. After surging on talk of Apotheker's departure on Wednesday, HP's stock was down 4.17% on Thursday.